We've been in Oregon for 2 weeks now, and we've seen the Sun twice. The first time gave us a beautiful rainbow while getting dinner while my parents were still here. Today was the second day, but let me come back to that. One of the target birds that I would like to see while I'm here is a Eurasian Wigeon. There were ebird reports from a small park near our place. So after I dropped my daughter off at school on Thursday, my son and I headed over to check things out. The park is Commonwealth Lake Park, and is part of the Tualatin Hills Parks and Recreation District (which is amazing, they also run Tualatin Hills Nature Park). Here's the ebird hotspot information for it too. There's a nice little playground there which lets my kids play while I look at the birds. And despite there being more than a few Wigeons there, they all looked like American ones to me. And let me say that the number of bird species there is impressive, I think that I reported 30 species over 3 trips. And it's nice when you get a lifer without looking for one. There were five sitting in some water between the playground and some swings. They were near hundreds and hundreds of Cackling Geese, and this Red-Tailed Hawk was looking over everyone. There were lots of waterfowl on the lake, but I didn't really get anything good of them, but the usual Mallards and AMWI were accompanied by Ring-Necked Ducks, Buffleheads, American Coots and a Common Merganser. 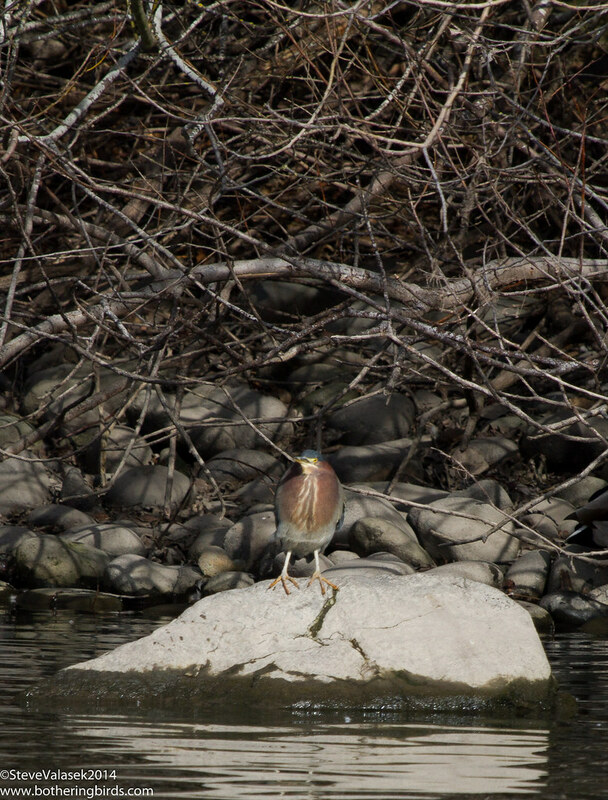 Great-Blue Heron and this Green Heron were also present. On 2 of the trips I saw Belted Kingfishers, the first trip the female the female was out, and the second trip it was a male. 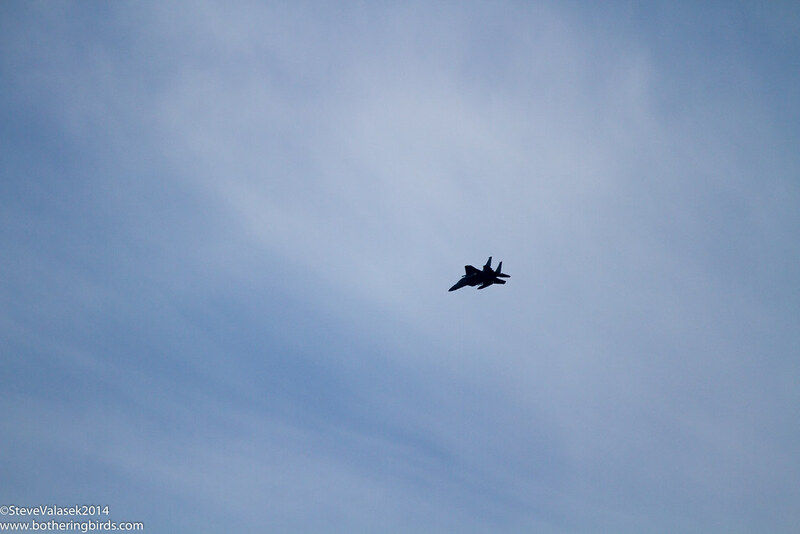 My son enjoyed seeing this non-reportable Eagle make some passes over the area. I ended up making 3 different trips there over 2 days. I took my daughter back after she was done with school, and then on Friday afternoon I met a local birder there for a tour. Still no Eurasian Wigeon, but we heard a Virginia Rail or 2 calling in an adjoining wetland and a River Otter was in the water too; but I didn't carry my camera beyond my first visit there. 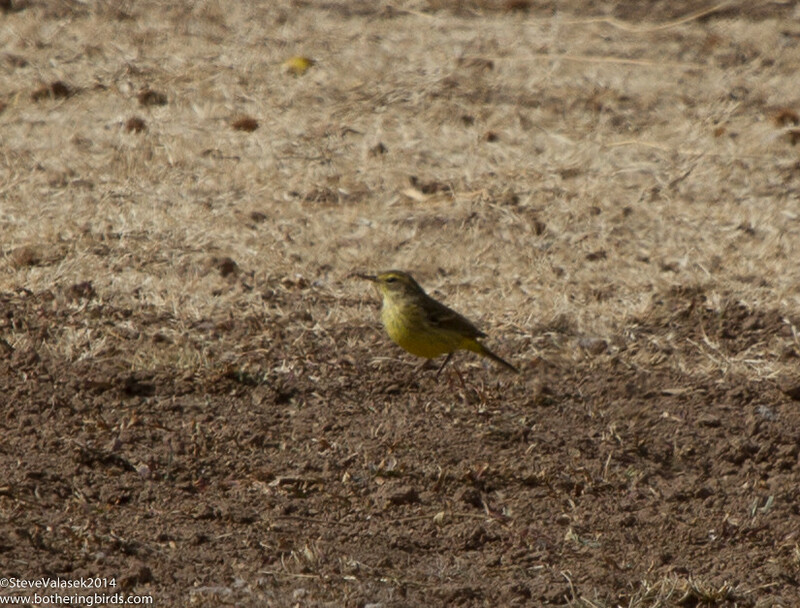 I do plan on making the park a common stop, I'm excited to see what migration brings. This morning I got a chance to go back to the Tualatin Hills Nature Park for another visit, and the Sun decided to make a rare appearance too. I was hopping see some Pacific Wrens and maybe some other new birds. It would turn out that I didn't see much new area of the park, but got some nice birds for the day. 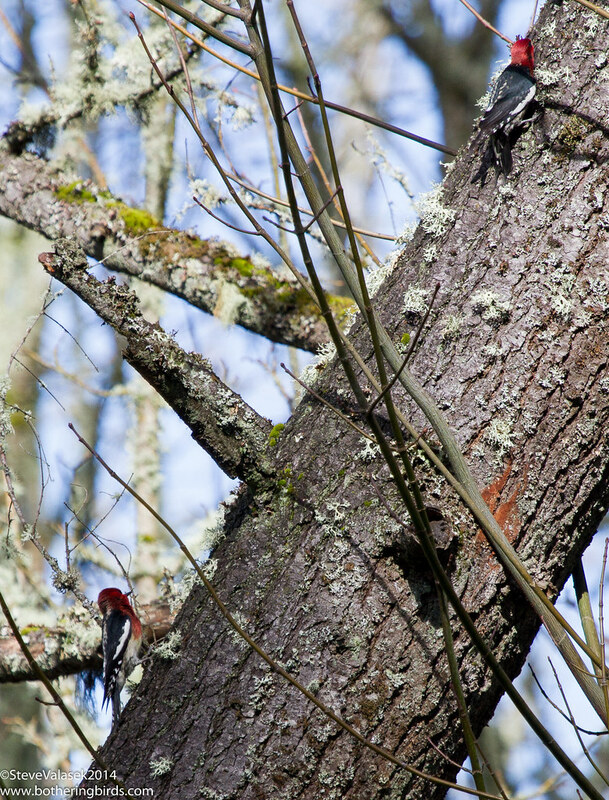 The area near the visitor's center was abuzz with activity, I saw my first Northern Flicker in Oregon calling way up in a tree. And some Spotted Towhees and a Bewick's Wren were making themselves known too. 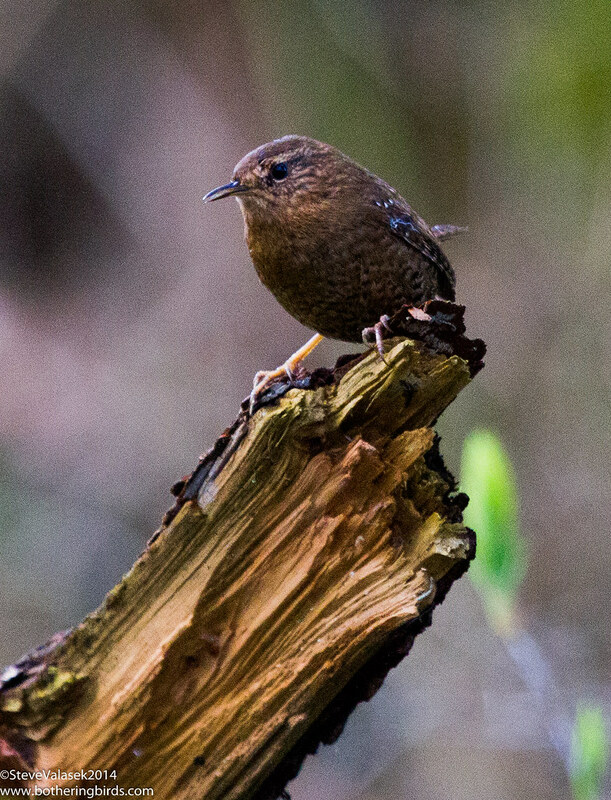 But it didn't take me long to start hearing, and then seeing, Pacific Wrens. I was making my way to the lake when I heard, and then saw, my first Chestnut-Backed Chickadees, along with some Brown Creepers, but was too slow for photos. I arrived at the Big Pond, but it was fairly quiet. Mostly Mallard city with some Gadwalls and Green-Winged Teal for company. I left to try and see more of the park when I heard some drumming on a tree. I took off towards the sound, but ended up passing it up, because now it was coming behind me. I quickly triangulated where it was coming from, but didn't see anything. 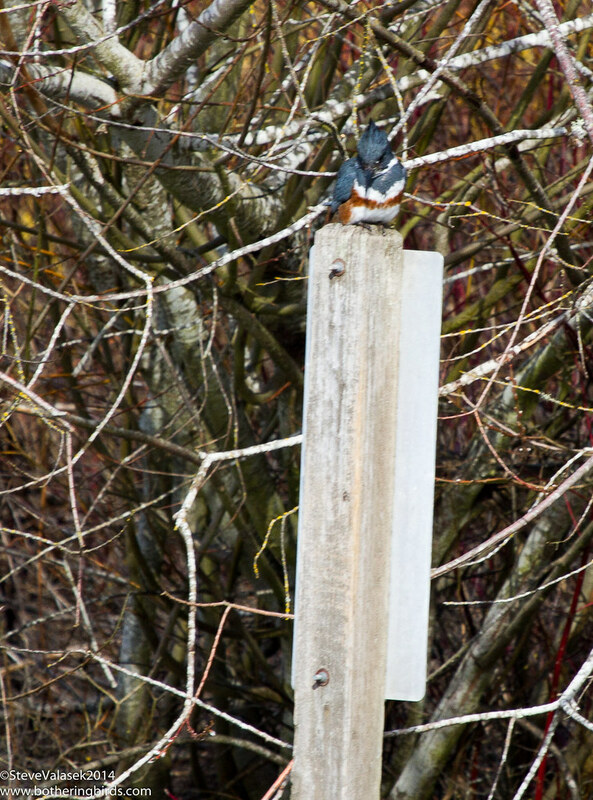 What I was hoping for was a Pileated Woodpecker, but instead I got a nice surprise. Three Red-Breasted Sapsuckers were chasing another and landing on trees. I managed to get a shot of 2 of them when they stopped for longer than 2 seconds. I made my way back towards the main path when I started seeing Pacific Wrens everywhere, singing their little hearts out. As I finally made it to the main path, I saw a doe ahead of me. It really didn't seem to mind people and waited around long enough for a bunch of pre-school kids to get a nice look at it. As I was contemplating on whether or not I had time to explore any more of the park before I had to head home, I happened to glance over my shoulder and see a bird on a tree. Thirty odd years ago I was in the woods with my brother back in Pennsylvania. There was a small stand of trees on my Great-Grandparent's property and my brother and I would play in there any chance that we got. One of the days we heard an odd sound way up in a tree. We looked up and saw a great black bird working at tearing pieces of bark off of a tree. I can still clearly remember that bird up there and how huge it seemed to an 8-year old kid. I've been longing to see another one for the 3 years that I've been birding, and really for those last 30 years. 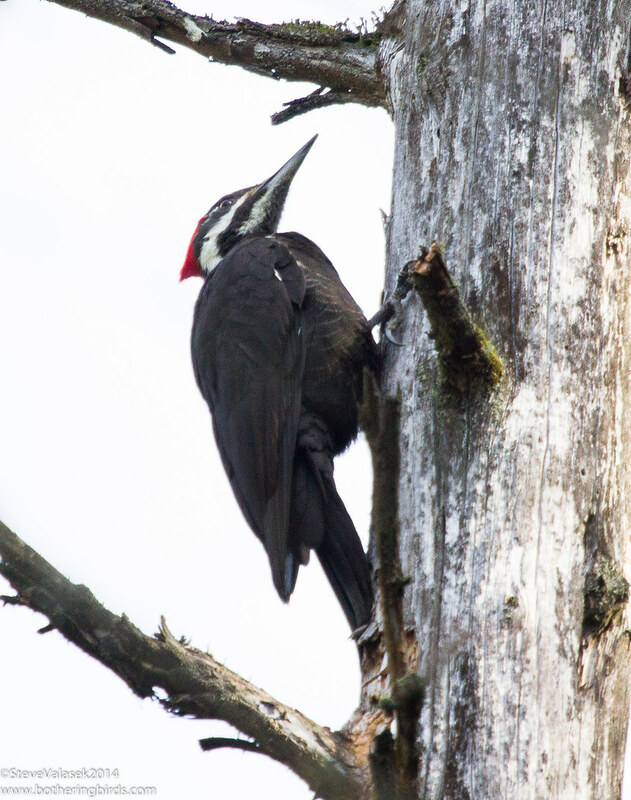 Well, what do I see today, a Pileated Woodpecker once again. This one bird made my entire day. I stood there for a few minutes watching it work some trees before it flew off and I lost sight of it. Hopefully it isn't another 30 years before I see another one. Heading back towards home I somehow saw a little creature on the path. My daughter and I had seen a larger one last weekend, but this was maybe a third of the size. I managed to get her to touch the tail of that one, and I did too. This one I helped off of the busy path by picking it up and putting it into the leaf-litter in the direction it was going. Later I relayed the sighting to one of the park rangers behind the desk at the visitor's center. He told me that it was a Rough-Skinned Newt and that they excrete a very potent neurotoxin on their skin. Not to touch them or handle them, and if you do, wash your hands and hope that you don't touch your eyes or have any openings to your skin. And that adults have actually died from them, usually by ingesting them though. The only animal that seems to be tolerant to the toxin is the common Garter Snake, which readily eats them. But through a series of co-evolutionary steps the newts have become really, really toxic and the snakes really resistant to it. 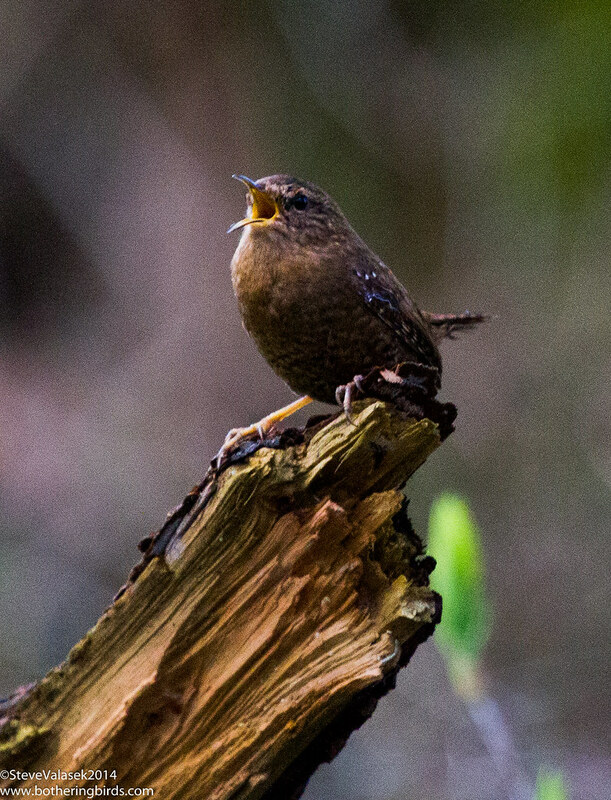 Walking back through the woods, I was witness to a few more Pacific Wrens singing their songs, heralding spring and welcoming back some Sun. I was going to post some photos that I took of birds while traveling through California, but I wanted to hold off and put up some ones from Portland. We've been here for almost 2 weeks already, but I haven't had much of a chance to get out. Lucky for me there are lots and lots of birds that live in my backyard. And by backyard, I mean in our apartment complex. I think that my one month yard total in New Mexico may have been 10 species, but I can get that in 15 minutes here. Behind our building is a small woodlot with lots of activity. I've seen Dark-Eyed Juncos (guess which type... go ahead! ), Lesser Goldfinches, Red-winged Blackbirds, a Red-Tailed Hawk, a Red-Shouldered Hawk, Bushtits and Chickadees, to name a few. This little Bewick's Wren was singing away at the very top of a tree, I've never seen one so bold before. And this is one of many Black-Capped Chickadees that frequent the trees around our building. And I've run into a flock of 2 dozen Bushtits a few days in a row, including today in the rain. 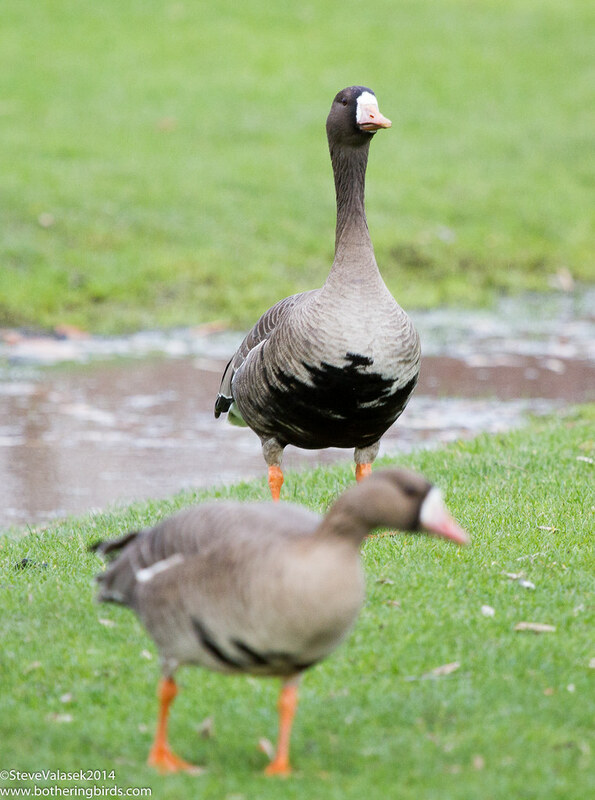 But these ones were near Beaverton Creek where it borders our Apartment Complex. Which is also where I saw lots of Lesser Goldfinches. And this Great-Blue Heron, who must be watching the Gulls too much. I was lucky enough to get an Anna's Hummingbird to perch pretty close to me, but no lucky enough for him to flash me the beautiful red of it's gorget. But I did catch it doing some early morning stretches. 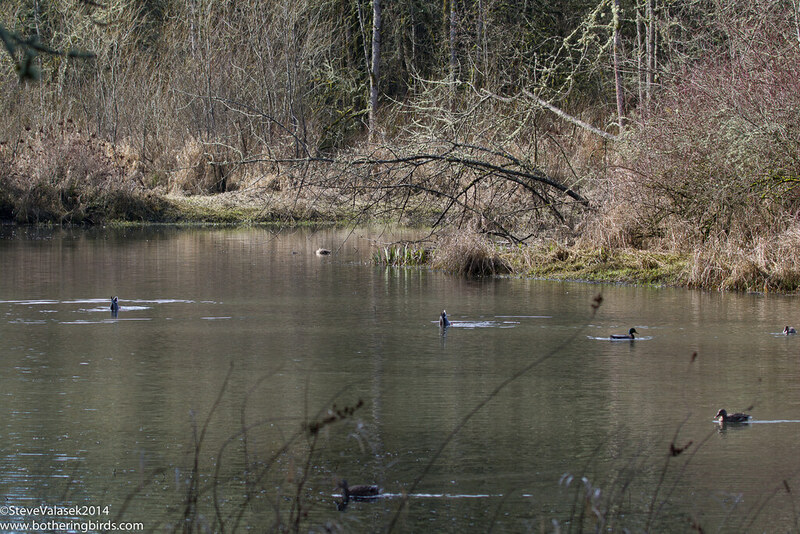 And in Beaverton Creek among a few Mallards were some Common Mergansers, which really surprised me. I'm used to seeing the on larger bodies of water, but I guess that is all we had in New Mexico. Anything smaller was an Arroyo. This Female was really photogenic. I'm also fortunate enough to live very near the very nice Taulatin Hills Nature Park, within walking distance actually. I finally made it over there late on Saturday. It's really impressive in it's size and the number of trees. And it's greenery. I'm actually overwhelmed with the density of the flora. I grew up in Pennsylvania, but it's much more intense out here. There is moss and lichen everywhere and on everything. On top of that, I'm really, really bad at bird calls. I know a handful, but was spoiled by always birding with people great at it, and by being able to spot birds very easily. Here in the shade and the constant over-cast skies, it's really hard to see the birds, but I hear them constantly. Walking around just part of the park I saw some Common and Hooded Mergansers, heard some Red-Winged Blackbirds and what may be Golden-Crowned Kinglets. I saw some tiny birds that really didn't want to come out into the open, which I think were Fox Sparrows! I plan on spending lots of time here. 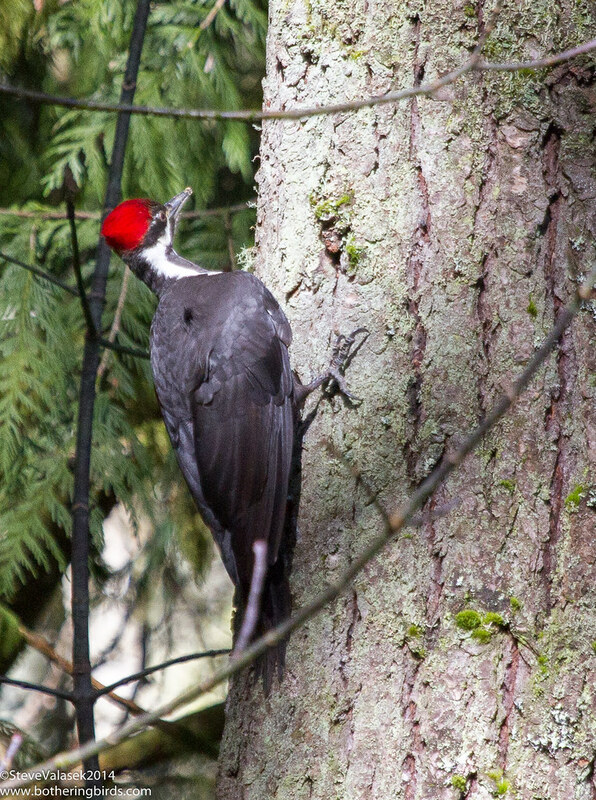 The fact that it has 4 of the species of birds that I really want to see in Oregon seen there often helps. But having a place that nice a half of a mile away is really a luxury for me. I was only there for an hour when I had to leave. But as I was walking back towards the main visitor's center, I saw a couple of civilians (non-birders) looking up into a very tall tree. I stopped to see what they were seeing when a large bird flew from a branch, circled the tree and then landed a bit higher. I asked them if they knew what it was and they said an owl. I located it and did a double-take. I was expecting a Great-Horned Owl (lazy me) when, in fact, a Barred Owl was looking back at me. A very surprise lifer. It was so high, and the light was so bad, that my shots were all lousy, but you can see what it was. I watched it fly off in the direction that I wanted to go, so I walked on. Once I was back on the main trail, I heard the familiar skitching sounds from an aggravated Accipiter (I said that I do know some calls). Shortly after I saw the owl flying again, this time chasing a bird through the tree-tops. They flew over my head and I recognized that it was a Cooper's Hawk with the shoe on the other foot! I was amazed and so excited. I don't know what happened, but my guess is that the Coop got away, they are the better fliers. But if I had any doubts about visiting the nature park whenever possible, they were gone at that point. I plan on making it back over there on Thursday and hopefully I'll get to see a Pacific Wren, Chestnut-Backed Chickadee, Pileated Woodpecker and/or a Varied Thrush. I'm writing this from rainy Portland Oregon. I'd like to apologize to the 3 people who read this blog that I haven't posted lately, but we finally moved from New Mexico to Oregon and it was very busy for us. But before we left, I managed to cross a couple of birding items from my list. 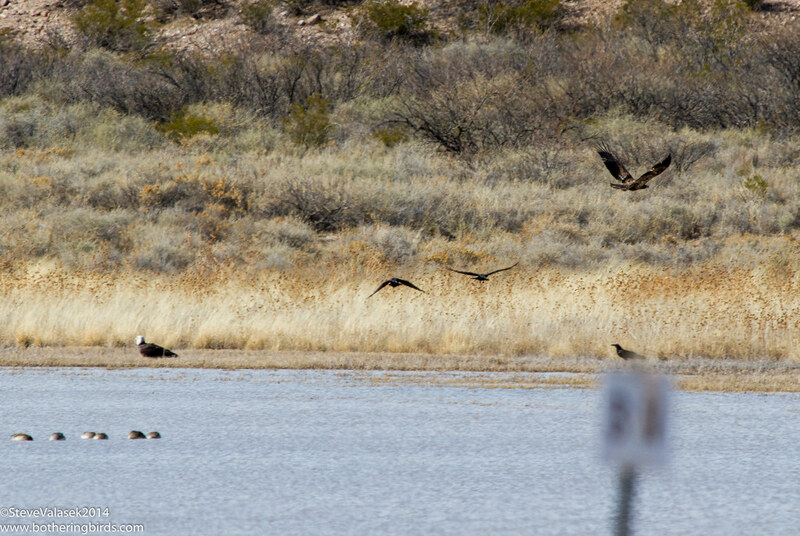 The first was that I made a final trip to Bosque del Apache NWR with the Thursday Birders group. This group is wonderful and I'll miss them and their knowledge and patience to a new birder. We started the trip taking the back-way through Socorro to San Antonio, ultimately to look for a Barn Owl (dip!) and a continuing Palm Warbler. We did manage to see a nice female Vermilion Flycatcher. 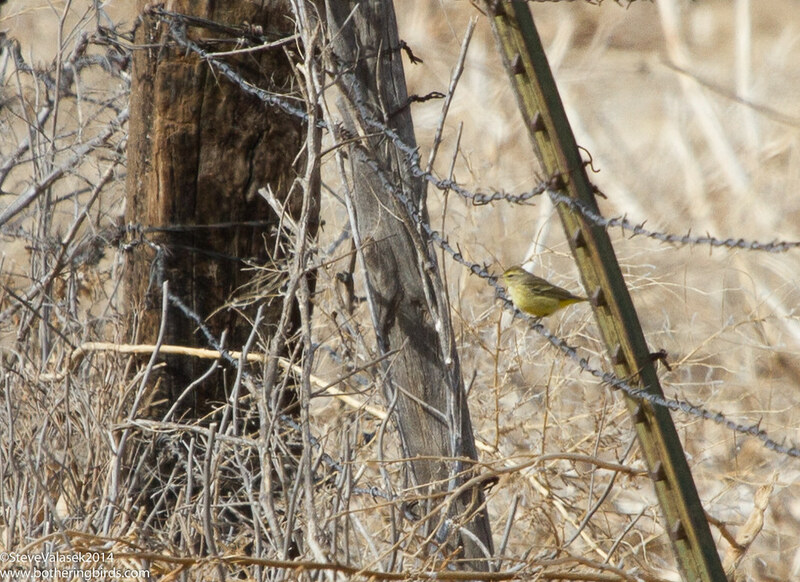 And the Palm Warbler was right where it was supposed to be, which was way out in the field. We made to Bosque del Apache without anything else too exciting. I noticed some other cars in the group at the first turn-off, which we weren't planning on stopping at, and wondered what was going on. It would turn out that no less than 5 Bald Eagles were visible. I managed to see 4 of them, including this one out across the water. But it got even better. 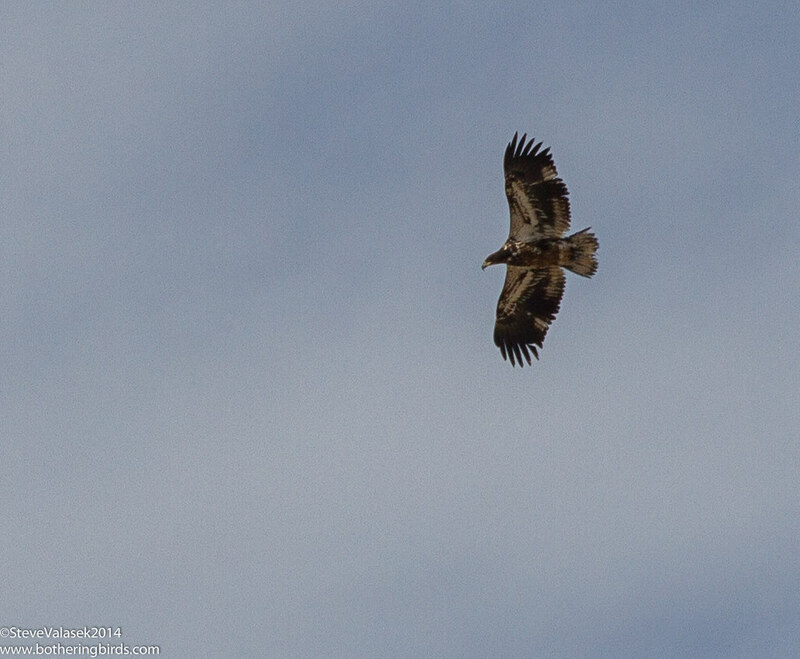 As we were watching the Bald Eagles, 2 more large birds came into the area, a couple of Golden Eagles. This was the same spot that I got my lifer Goldens a few months prior. One of them even landed by one of the Bald Eagles to see what it was eating, looked like a Sandhill Crane, but took off a few moments later. At the visitor's center I managed to get a lifer Brewer's Sparrow, which was sitting near the feeders. The one other thing that I wanted to do before I left New Mexico was to see a Crissal Thrasher. I had been trying to see one for a solid year. I made over a dozen trips to the areas of Albuquerque where they were known to be, and the few spots that ebird had them reported this year. But I never had any luck. I even think that I saw one last year in Embuditio Canyon, but the light was horrible, the Sun had just set, and I was never 100% sure that it wasn't a Curve-Billed Thrasher. But someone was seeing CRTH in Embudo Canyon regularly and I got directions. I had one last chance to go there and see one and I took it, just 2 days before we were moving. I got there early and hustled uphill. I ended up going higher than I had before and sure enough, the first bird that I see is a beautiful Crissal Thrasher soaking up the first rays of the Sun and singing it's pretty little head off. I saw the Thasher so easily, that I had enough time to drive down to the Rio Grande Nature Center for one final morning bird walk. This is another great opportunity for a new birder to learn some things about birds, or for a visitor to see a nice assortment of local birds in a short time. The highlight of the walk, where we happily had 35 species, very good for January, were these to Sparrows showing off their differences. So that's it for me and New Mexico. I have some nice photos from our time in California which I'll put up next. And I've just begun to see all of the birds in my new neighborhood.